Masala paniyaram are also known as kuzhi paniyaram, appes, appams and paddu. Masala paniyaram recipe are made from left over idli or dosa batter. Let me be honest this just melts in your mouth and is one of the most delicious snack you would come across. They are crunchy from the exterior and soft from within, hence I love them. They are ideal for breakfast, snack, lunch box or quick meal. Appes are also sold as street food in Bangalore and some southern parts of India. Paniyaram’s are made of 2 types mainly one is the sweet paniyaram and the other is masala paniayaram. There are many version of paniyaram some are also tempered first and then added to the batter. My version of Masala paniyaram recipe is simple, quick and healthy. We make them quite often as we love them a lot. You need the paniayaram cookware (maker / vessel) to make paniyarams. I have used a non stick kulippaniyaram cookware from Kerala which was gifted to me by mom. 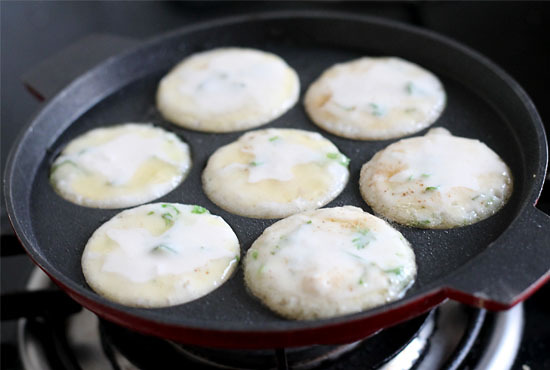 If you don’t have the paniayaram cookware one don’t worry either you could make idli, pancakes (dosa) or deep fry them as fritters. Either way it would taste good but the batter has to be thick while making either of them. Also add all the ingredients just before making paniayarams else it would leave moisture making the batter thin. If you make paniyarams once you would make them quite often. Make your own version by adding shredded carrots, boiled peas etc. Also it consumes less oil hence quite healthy, nutritious and delicious snack. 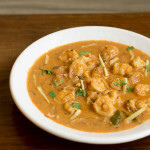 They are eaten with coconut chutney or a person like me could even eat with tomato sauce. You could check some south Indian recipe like sambar, south indian prawns curry, microwave mung idli, sweet potato curry, tomato rice, curd rice and ragi dosa. 1.Mix all the ingredients into the idli batter. Check if salt is required then add accordingly. I don’t have a pic for this one. 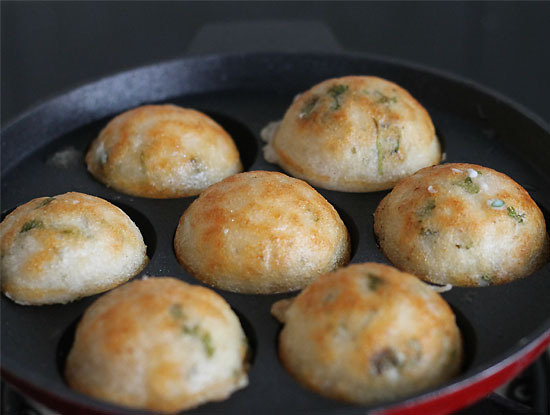 Place the paniyaram cookware on medium heat. Add a few drops of oil in each mould. 2. Pour spoonful of the paniyaram batter leaving some space over the top for it to rise. 3. Allow to cook for 3-4 mins on medium heat. Once you see them browning from top. Try to check the edges with a wooden skewer or spoon. If it’s cooked just flip over other side gently and allow the other side to cook. 4. You could turn again them if you want them to be more crisp. Remove and cover them with a lid so it stays warm. Repeat the same with the rest of batter. 5. 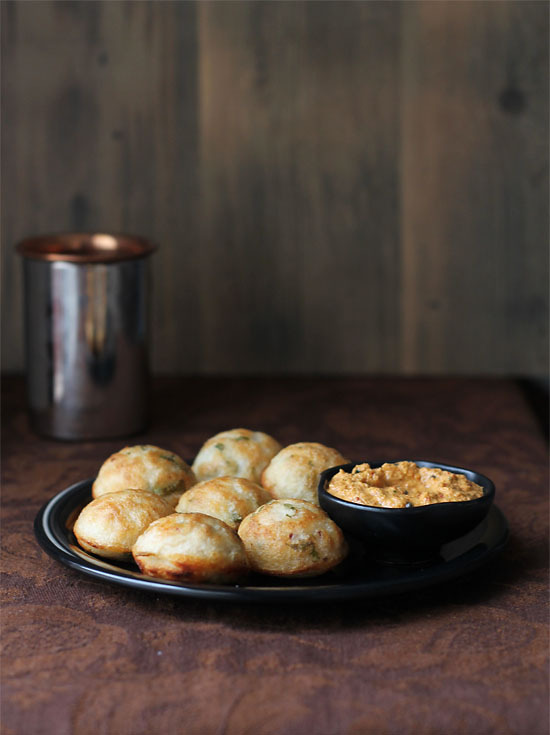 Serve the masala paniyaram hot with any chutney of your choice. 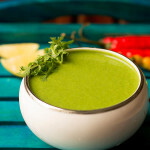 Check some chutney recipes like red coconut chutney, peanut chutney, green chutney, sweet chat chutney, onion tomato chutney and hotel style coconut chutney. 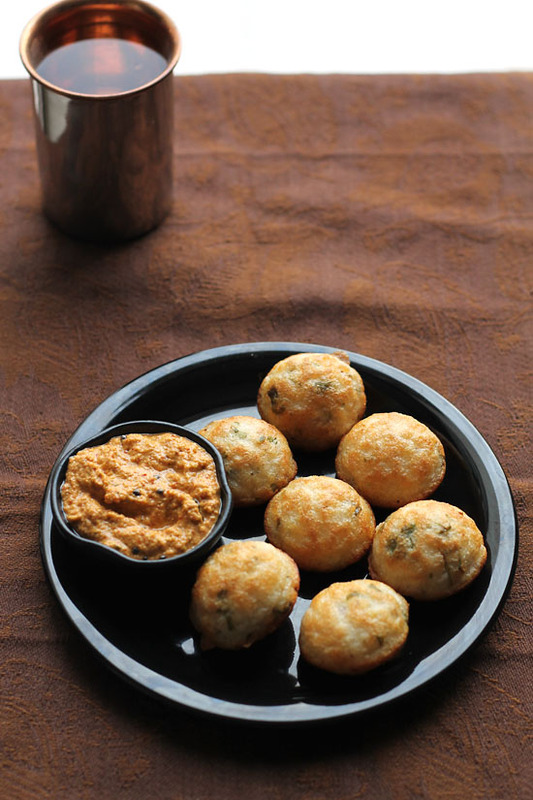 Masala paniyaram are also known as kuzhi, appes, appams and paddu. 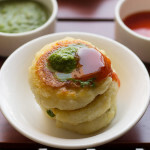 Masala paniyaram recipe are made from left over idli or dosa batter. Mix all the ingredients into the idli batter. Check if salt is required then add accordingly. 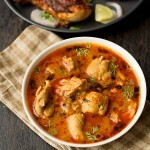 Place the paniyaram cookware on medium heat. Add a few drops of oil in each mould. Pour spoonful of the paniyaram batter leaving some space over the top. Allow to cook for 3-4 mins on medium heat. Once you see them browning from top. Try to check the edges with a wooden skewer or spoon. If it's cooked just turn or rotate them gently and allow the other side to cook. You could turn again them if you want them to be more crisp. Remove and cover them with a lid so that it stays warm.- Repeat the same with the rest of batter. 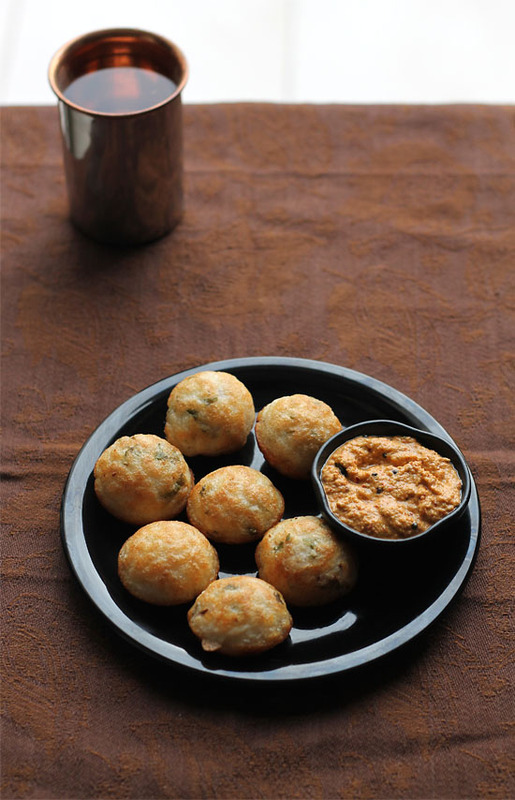 Serve the masala paniyaram hot with any chutney of your choice. 1. Ensure the batter is thick for holding the paniayaram shape. 2. Add any veggie of your choice but make them as soon as the batter is made else it would have a lot of moisture otherwise. 3. 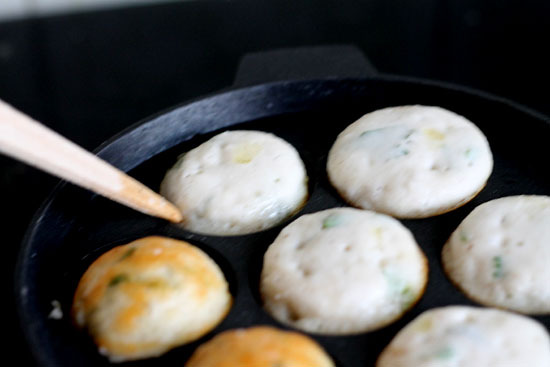 You could make paniayarams from let over idli, dosa or medu vada batter. 4. 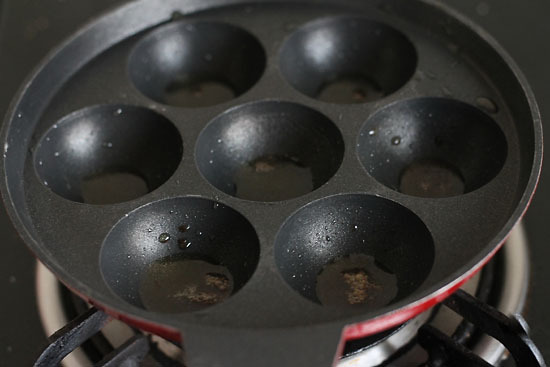 In case your paniyarams stick to the bottom then try leaving some oil in your cookware overnight. I see a new use for my abelskiver pan! 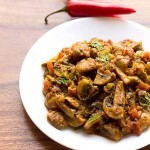 This looks like the perfect food for a Dane who married a Bengali! Congrats Jolene on your new start of life. Let us know how the paniyarams tasted? 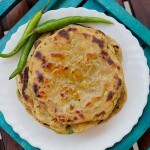 Thankyou 🙂 I understand but if you follow the instructions given in this post here is the link http://www.flavorsofmumbai.com/plain-dosa-recipe/ you should eb able to make the batter easily. Give it a try.